Dausgaard has chosen to illuminate “Kullervo” by assembling an onstage preview, in which excerpts from the work are presented alongside the Nordic folk music that inspired it. The performance of “Kullervo” that followed was remarkably colorful, full of vitality and also a deep melancholy. 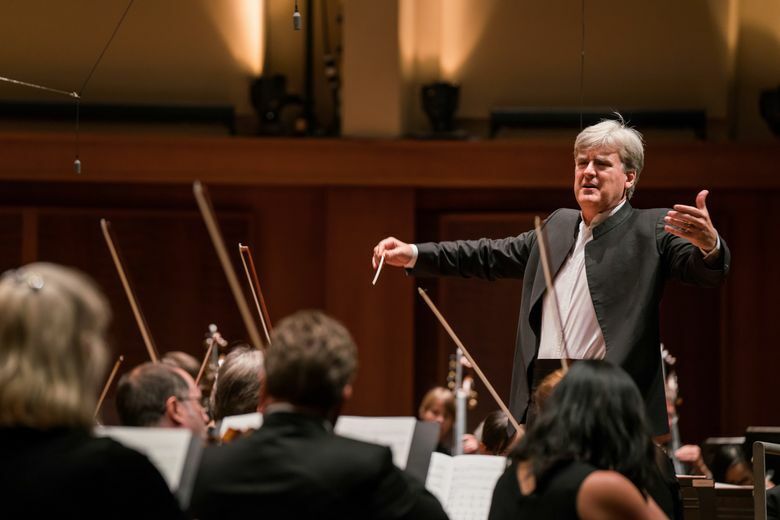 Seattle Symphony fans vividly remember the 2015 Sibelius Festival, when principal guest conductor Thomas Dausgaard conducted all seven Sibelius symphonies with the kind of audience response you usually see in championship sports events. No wonder Dausgaard, who will become the orchestra’s music director in the fall of 2019, has chosen another major work of the Finnish composer for the current set of subscription programs. This time it’s “Kullervo,” Sibelius’ setting of episodes from the Finnish epic poem about the adventures (and misadventures) of a flawed hero. Most conductors would program and conduct the work in the belief that audience members who wanted to find out more would simply consult the program notes. Not Dausgaard. Instead, he has chosen to illuminate “Kullervo” by assembling an onstage preview, in which excerpts from the work are presented alongside the Nordic folk music that inspired it. This preview, designed by Dausgaard and composer/musician Timo Alakotila, brought the audience inside the music in some delightful ways, revealing, with the aid of traditional instruments, the sounds that might have been in Sibelius’ mind as he composed this epic work. Joining the Symphony players and Symphony Chorale singers on the Benaroya stage were Ilkka Kallio, a runo singer (specialist in early Finnish folk song); Vilma Timonen, a kantele (Finnish zither) player; and Alakotila, at the harmonium (a small manually-pumped organ that gave a wonderful flavor to the folk music). Their evocative sounds, along with those of soprano soloist Maria Männistö and members of both the Cappella Romana vocal ensemble and the Seattle Symphony Chorale, gave the listeners a musical window on Sibelius’ inspiration. The performance of “Kullervo” that followed this introduction was remarkably colorful, full of vitality and also a deep melancholy. Audience members could hear clear traces of the folk music they had just heard in the preview. With Dausgaard’s precise, eloquent leadership, the work’s episodes took shape in a performance of surging energy. In the third movement, depicting the ill-fated meeting of Kullervo and his sister, baritone soloist Benjamin Appl was impassioned and impressive. Männistö sang with her usual clarity and elegant lyricism, though the musical lines were sometimes a bit low for her ideal range. Dausgaard cued the soloists so attentively that he probably could have sung right along with them. This is clearly music of his heart; lucky are the listeners who get to share it. “The Seattle Symphony Orchestra presents Sibelius’ ‘Kullervo,’” with Thomas Dausgaard conducting; Thursday evening (repeated at 8 p.m. Saturday, June 2; 2 p.m. Sunday, June 3); Benaroya Hall, 200 University St., Seattle; 206-215-4747 or seattlesymphony.org. Melinda Bargreen, a Seattle Times reviewer since 1977, is a composer and the author of two books, “Classical Seattle” and “50 Years of Seattle Opera”; she also writes for several publications. She can be reached at mbargreen@gmail.com. This report is supported, in part, by the Rubin Institute for Music Criticism, San Francisco Conservatory of Music, and the Ann and Gordon Getty Foundation.